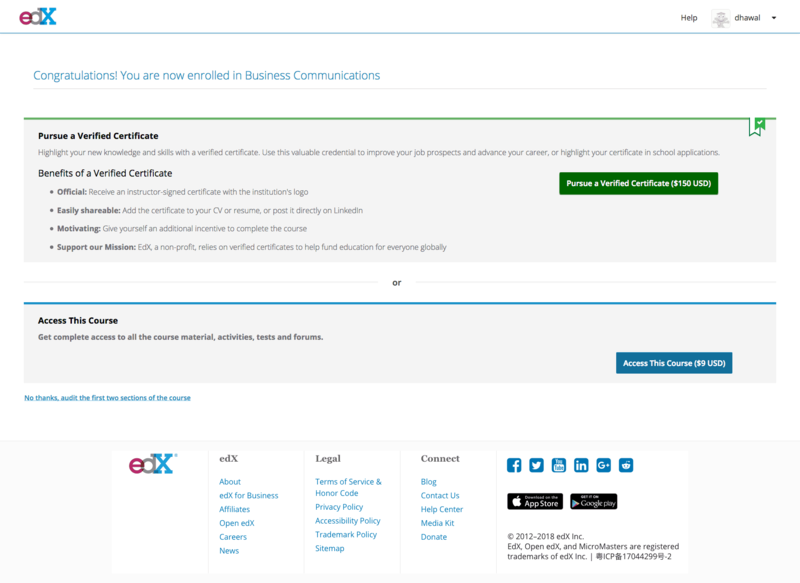 Class Central has been keeping track of MOOC-based microcredentials ever since edX launched the first one, Xseries back in 2013. Since then all the major providers have launched at least one microcredential, and in many cases, the providers have gone ahead to trademark them. Each provider is competing to build the credential of the future. Class Central’s Laurie Pickard analyzed these 11 different types of microcredentials offered by five different platforms. You can find the analysis here. Laurie will also be presenting her results at the upcoming Learning With MOOCs 2018 conference held at the end of September, in Madrid. Laurie has also proposed a session on microcredentials at next year’s SXSW EDU conference in Austin, TX. You can vote for her session here. Looking at published data about the cost, time, effort required to complete these different microcredentials, it is clear that there is very little standardization among them. There is as much if not more variability within each type of microcredential as across types of microcredential. This variability and lack of standardization poses a problem for both learners and employers, as it makes it difficult to compare the various microcredentials. While all employers understand that a master’s degree signifies a higher level of preparation than a bachelor’s degree, it is impossible to say whether a Udacity Nanodegree prepares a person more or better than an edX Professional Certificate or a Coursera Specialization. Analysis of 450 MOOC-based microcredentilas (11 different types). 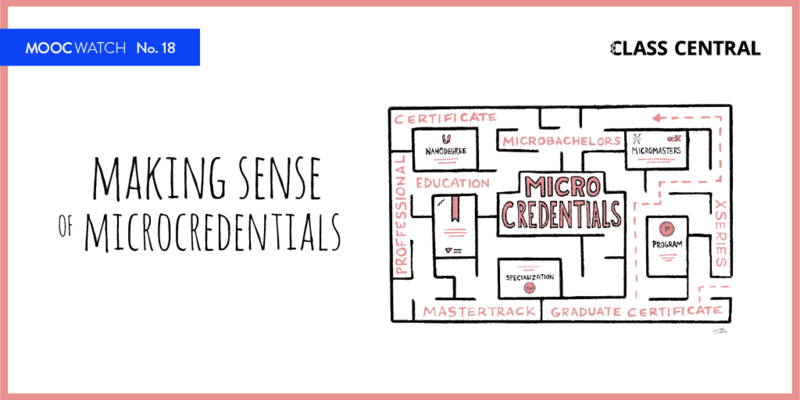 The analysis points to a lack of consistency among microcredentials, making it difficult to compare them or interpret their significance, for prospective learners and employers alike. 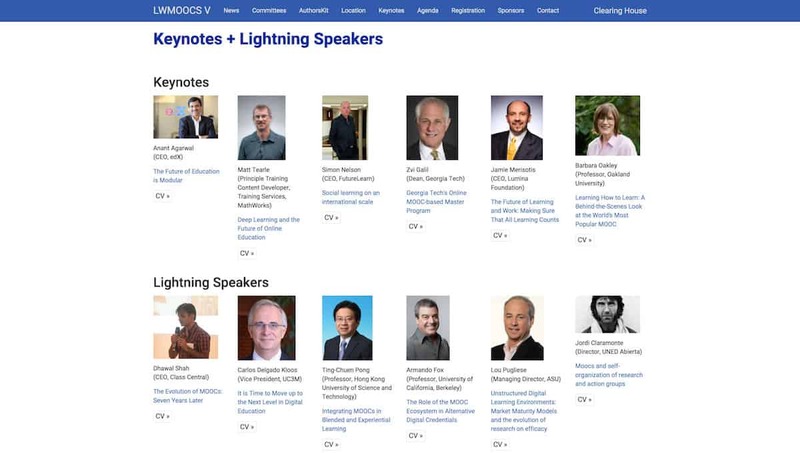 The fifth annual Learning With MOOCS (LWLMOOCS) conference takes place from 26-28 September 2018. LWMOOCS 2018 will be held at UNED (Universidad Nacional de Educación a Distancia) and UPM (Universidad Politécnica de Madrid), in Madrid, Spain. A few months of ago I speculated that online degrees are the second wave of MOOC hype. Since then, we have seen a flurry of MOOC-based degree announcements including a Master’s degree from an Ivy League school. 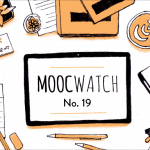 Class Central has published its updated list of Top 50 MOOCs of all time. The 2018 edition consists of courses from 37 different universities. Edx plans to move away from its policy of “Offering Virtually Everything for Free” and will be testing a number of different paywalls. The first of such paywalls will be a support fee. One example of this test discovered by Class Central allows learners to audit the first two weeks of the course for free, with full access available for $9. This webinar (held on September 13th, 2018 – RSVP here) brings together institutions of higher education known as leaders in innovation to describe and discuss the successes and challenges of developing and delivering alternative credentials such as MicroMasters and Specializations. Fiona Holland, a researcher from the Center for Benefit-Cost Studies of Education (CBCSE) at Teachers College will highlight key findings from a study of the benefits and costs to learners of participating in MicroMasters and Specializations. Panelists from Teachers College, Wharton, MIT, and the University of Michigan will discuss their online initiatives. On the occasion of the first iMBA graduation, I sat down with Coursera’s CEO Jeff Maggioncalda and Dean of the University of Illinois Gies College of Business Jeffrey Brown to reflect on the program and to discuss how it is influencing online learning in particular and higher education in general. Class Central’s Laurie Pickard spoke with recent graduates of the iMBA to get an insider perspective on the program. Finally, Laurie and I discuss what I learned when I visited UIUC for the iMBA graduation ceremony. 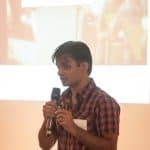 Manoel got his Bachelor’s degree in CS from OU and now is getting his Master’s through Georgia Tech’s OMSCS. In this article, he retraces his steps at the OU, from enrollment to graduation. The goal is twofold: first, to give a sense of what it’s like to study with the OU; second, to highlight particular aspects of the OU experience that aren’t readily apparent from the outside, but that every prospective student ought to know. I was interviewed early this year by EdSurge Jeff Young’s at SXSWEDU. EdSurge recently published the interview. Class Central recently made a list of all the courses we could find that are part of for-credit programs and are still free to access. Our search turned up around 400 courses from 49 different universities, on topics spanning technology, business, the arts, and engineering. With the help of SDG Academy, a free online education platform from the United Nations’ Sustainable Development Solutions Network (SDSN), Class Central has pulled together a giant list of courses that will teach you about the UN’s ambitious set of Sustainable Development Goals. Whether you’re interested in poverty reduction, human rights, food security, public health, education, or any other sustainable development topic, these courses will help you join efforts to achieve prosperity for both people and planet. Coursera co-founder Andrew Ng Deep Learning specialization already boasts 250,000 enrollments and his original Machine Learning course has 1.7M enrollments. Georgia Tech’s MOOC-based Online Masters in Computer Science (OMSCS) has received over 10,000 enrollments and is potentially the largest Masters in CS program in the US and the world. EdSurge’s Jeff Young takes a look at some of the top MOOCs on Coursera and edX. Udacity has completed the switch to term-based scheduling for its Nanodegrees, which means for all Nanodegrees have a start date and end date instead of the monthly subscription model. The term based scheduling means that that students need to finish all projects before the end of the term. Those who fail to do so are offered a 4-week extension to complete any outstanding projects. If they don’t, they are kicked out of the program and lose access to the content. A Udacity student reviews her Data Science Nanodegree experience. She was one of the 15,000 students who received a scholarship through a joint program between Udacity and Bertelsmann, a media company. All the students were put into the same cohort. Two weeks before the deadline only around 900 students had completed all the course materials, a completion rate of only 6%. Interestingly, this completion rate is very similar to that of free MOOCs. Does the act of payment itself influence completion rates? An award-winning professor at Kansas State University launched an online course in anthropology to solve its budget woes. The course is free to take but students can pay to enroll in a for-credit version. So far the course has seen 350 paid students, which covers the costs of about one-and-a-half faculty positions. In a post on Coursera’s engineering blog, the company shared details on its A/B testing platform for course content. In another post on the engineering blog, Coursera also shared details on its new method of “Automated Coaching”. Learners going through a course receive different kinds of pop-up messages, or interventions, as Coursera calls them. Y Combinator (YC), the leading startup incubator/accelerator has announced its second edition of the Startup School MOOC. This time around 100 of the most promising companies that complete the course will receive $10,000 in equity-free funding. I have internal funding and approval to offer a MOOC this fall titled 'e-learning 3.0' which will cover the next generation of e-learning technologies (*lots* to cover here). I'll be using gRSShopper to offer it, and participants can use their own gRSShopper instances to take it. Class Central’s Laurie Pickard spoke with Jose Escamilla, Director of Teclabs, and Julien DePauw, who leads MOOC projects at Mexico’s Tecnológico de Monterrey. As we learned, MOOCs are not a one-off for Tec Monterrey. Rather, they are part of an integrated effort to prepare for the future of higher education. Campus-il is an Open edX based online learning platform run by Digital Israel, an initiative of the Israeli Ministry of Social Equality. All of the courses on the new Campus-il platform are offered in Hebrew or Arabic. The staff behind CS50, Harvard’s most popular on-campus course added three new online courses, each of which could be considered as a sequel to CS50x. They all pick up from where CS50 leaves off. Forty-two students who completed the Supply Chain MicroMasters by MIT on edX, were admitted the residential Master’s in Supply Chain Management. And now the first batch of students have graduated. MIT has announced over 50 MicroMasters so far, but it seems only one of them ever makes the news. Designing accessible online courses is no easy feat, especially when you take into account the wide range of accommodations that might be necessary for learners in a course whose enrollments may number in the tens or even hundreds of thousands. At the Gies College of Business at the University of Illinois Urbana-Champaign, the digital media for eLearning team has stepped up to the challenge of creating accessible content. Now in its tenth year, the ASU + GSV Summit is an annual event focused on innovation in education, learning, and workforce development. The summit is a veritable who’s who of the education world. Here is our summary of what went down MOOC-wise at the 2018 ASU GSV Summit, with links to the various talks. Back in 2015, four liberal arts institutions formed a MOOC consortium. Inside Higher Ed reports that consortium is no longer active. Fiona Hollands, researcher from Teacher’s College, Columbia University gave a keynote titled “MOOCS 2025” at the Open edX conference in Montreal. In her talk, Dr. Hollands suggested a few alternate acronmys that we can use instead of “MOOC”. classcentral.com is really great . They do a wonderful jobs regarding online and MOOCs. 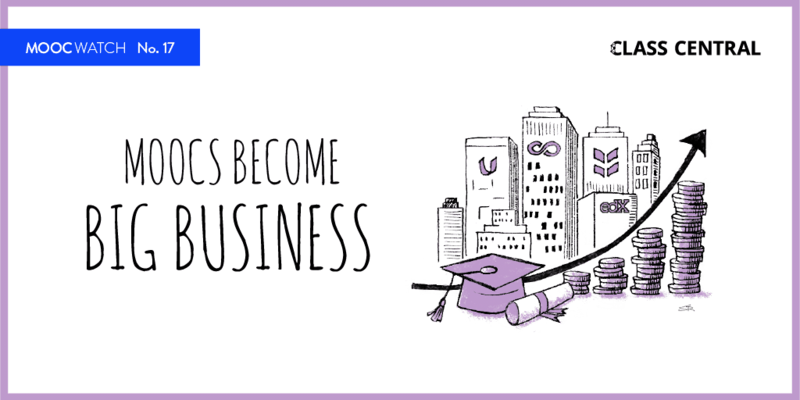 See my MOOCs university open to 8 billion people of the world . Class-Central inspired me to do it . Take courses from Harvard, Stanford, Yale, MIT, Princeton selected from 10.000 available MOOCs courses . We selected only 200 courses for you out of 10.000 courses . So get your masters free. free. free.